If not for a few key turns of events, Siyamiyateliyot Elizabeth Phillips might not be the last surviving fluent speaker of Upriver Halq’eméylem, the language of the Stó:lō people. The first one was the tragic loss of her mother, who died giving birth to her in 1939. Her father already had several children to care for, and he took Elizabeth from her home village of Cheam across the river to Seabird Island to be raised by the Peters family, who were fluent Halq’eméylem speakers. The second was becoming an honorary elder in the Stó:lō community while still in her 30s. The mother who raised her wanted to participate in the Elders Language Circle at the Coqualeetza Education Centre, but needed Elizabeth to translate for her as she only spoke Halq’eméylem. So Elizabeth was immersed in conversational sessions with elders several decades older than her, and kept her Halq’eméylem language skills sharp. And the third is the more than 50 years of work she has put in formally working to preserve the language, cooperating with linguists and other professors from a variety of universities. Now this formerly young elder is a true elder, approaching the age of 80, and has outlived those with whom she used to enjoy speaking her language fluently. But she continues to work to keep Halq’eméylem alive. 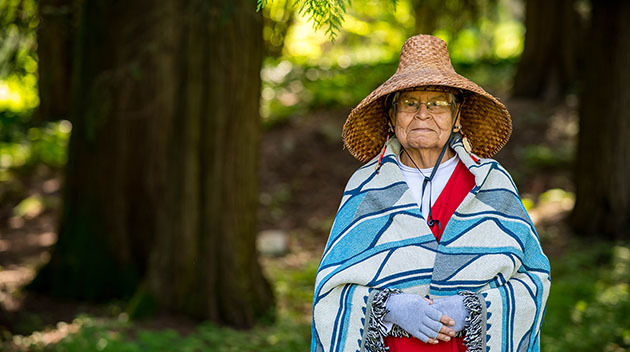 For her efforts to ensure that current and future generations can speak the language, the University of the Fraser Valley is recognizing Elizabeth, whose Stó:lō name is Siyamiyateliyot, with an honorary Doctor of Letters degree at its June 6 afternoon convocation ceremony, starting at 2:30 pm. The public is welcome to attend. It can be lonely being the last fluent speaker of a language. Elizabeth even thinks and dreams in Halq’eméylem, but has nobody to converse fluently with anymore. While being interviewed, she casually peppers the conversation with Halq’eméylem words such as xwelítem for white person, and Kwikwetlem for the community of Coquitlam. As a child, many in her community spoke Halq’eméylem, but after residential school experiences, the children came home not knowing their language and eventually only the elders could speak it. In spite of many obstacles, Elizabeth’s dedication has enabled her to share her knowledge of Halq’eméylem widely. She has devote over half her life to trying to save her ancestral language, and generously helps anyone who wants to learn it. She worked at the Coqualeetza Education Centre on efforts to preserve the language, starting in the 1980s. These days, she regularly visits Halq’eméylem classes offered by UFV. In the 1970s and 80s, she cooperated with professional linguist Brent Galloway and other fluent speakers to create the Halq’eméylem dictionary, helping to preserve a language that was fading fast. In recent years, linguist Strang Burton recorded her speaking her native tongue both on film and as an ultrasound recording, enabling students to see how the muscles move inside the mouth for certain sounds. Elizabeth and the late Xwiyólemot Tillie Gutierrez and linguist Susan Russell co-authored Talking in Halq’eméylem, Documenting Conversation in an Indigenous Language, published in 2017. For Elizabeth, it’s the casual encounters with her former students that make her efforts worthwhile. She has proudly witnessed some going on to earn their education degrees and become teachers. Others stop her on the street to thank her.